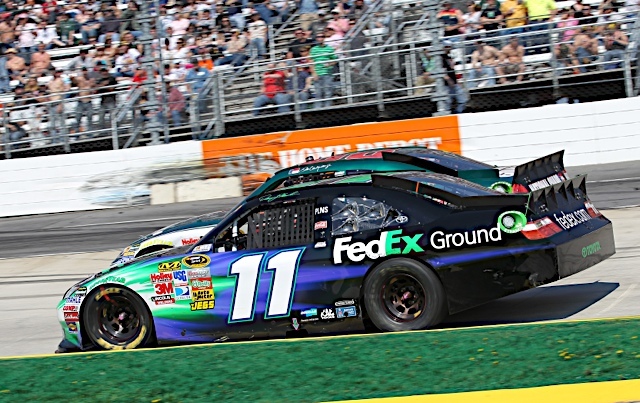 Denny Hamlin drove the #11 FedEx Office Toyota to a top-10 finish at Talladega Superspeedway on Sunday, finishing eighth in the race won by Clint Bowyer. With the finish, Hamlin moved up one spot to hold 11th in the Chase for the Sprint Cup standings with four races remaining in the season. To start the race, Hamlin was the odd-man-out with 43 cars on the track and struggled throughout most of the day to find a draft partner. By lap 25 of 188, the FedEx team was down a lap and needed the Lucky Dog to get back on the lead lap. Using various drafting partners throughout the remainder of the event — including teammates Kyle Busch and Joey Logano, Juan Pablo Montoya and Ryan Newman — the #11 Toyota worked from the back to the front. However, Newman’s damaged car was unable to keep the duo in the top-10, with the two slipping back. A caution with 15 laps remaining enabled Hamlin and Logano to link back up, and the duo sliced through the field to get back in contention. Hamlin was collected by Mark Martin in an incident, but quick work by the FedEx crew got Hamlin back on track for the finish, where he was able to move up to eighth for the checkered flag. The Series shifts to Martinsville (Va.) Speedway, a track that Hamlin has had great success at throughout his career. The 30-year-old Chesterfield, Va., native has won four races at the 0.526-mile ‘paper clip,’ including the last two fall Chase races. Hamlin has been dominant at Martinsville in his career, finishing in the top-five in eight of 12 starts at the track. In the spring race at the track, Hamlin started fifth and led a race-high 89 of 500 laps, but an untimely caution after the FedEx team had made its green flag pit stop yielded a 12th-place finish. Hamlin swept the two races at the track in 2010, starting on the pole and leading 40 laps en route to victory lane in last year’s fall race. The spring race saw a determined Hamlin charge from ninth to first in four laps for the win, just two days before undergoing reconstructive knee surgery. Hamlin earned his first victory at Martinsville in the spring 2008 race, and won again in the fall of 2009. In total, Hamlin has led 1,038 laps at the track, and has an average finish of 6.6. Piedmont District Along for the Ride in Martinsville The FedEx Ground Piedmont district, covering most of North Carolina and southern Virginia, is one of the leading teams in “Quality Driven Management” principles, and will be recognized with its “PIED” code letters on the b-post of the #11 FedEx Ground Toyota this weekend.